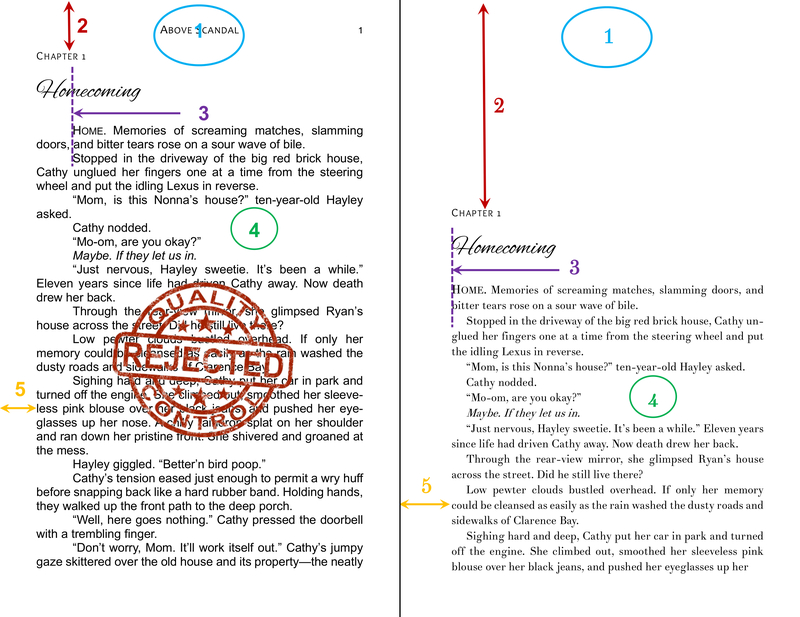 How can you tell, at a glance, if the print book in your hands has been expertly formatted? On the first page of each chapter, page headers are correct in their absence. That’s right, there aren’t any; no author or book title or page number. Just a focus on the text. Footers are fine and can be very helpful for a complex work of non-fiction. The amount of white space depends on the page size and the font sizes. You want enough content to hook the reader with whatever story you’re telling or information you’re to sharing. All other pages start immediately below the top margin. Regardless of the presence of drop caps or small caps, the first paragraph has no first line indent. Later in the book, the first paragraph after a section isn’t indented either. For all other paragraphs, go for a .2″ first line indent. The industry standard is a size 11 serif font. See the prior post for a comparison of different serif fonts in the same size. Even more information on serif vs sans serif is here. Some works, e.g., poetry, magazines, reports, use a sans serif font, but a serif font is what readers will expect in a print book. To allow for easy reading of a physical book, the inside margins have a gutter added to prevent the text from squeezing into the binding. Want proof? Wander over to your bookshelf, or down to the local library, and scan a book by one of the “real” New York publishers. Now that you’re more aware of such things, what other differences can you see between the amateur and the professionally-formatted books?